This artist is not the same Suzuki Osamu (born 1926), who is the leader of the avant-garde 'Sodeisha' group and who is also represented in the gallery's collection. 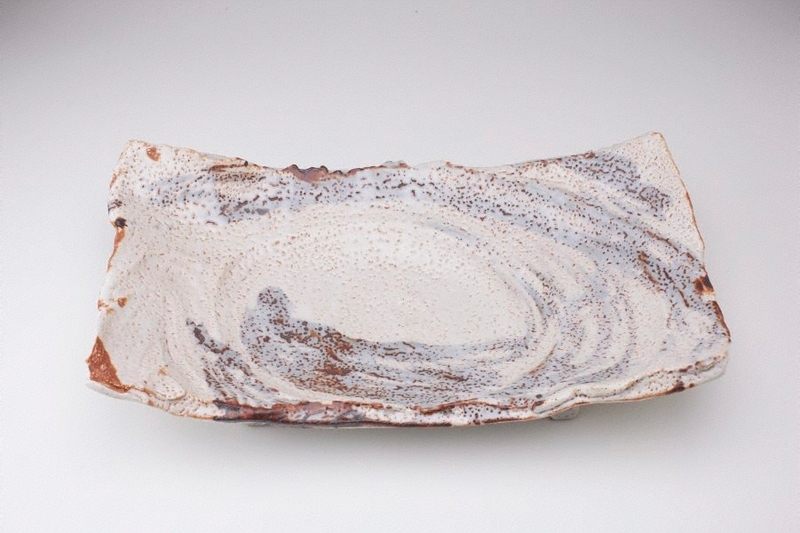 Suzuki is a leading traditional style potter whose work is distinguished by the use of creamy rich, tactile glazes highlighted by unglazed areas of the burnt-orange body. In this particular piece, the artist, as well as using a traditional Shino-type glaze, has been inspired by a traditional Japanese shape - that of the basic wooden chopping board found throughout Japan. Suzuki has exhibited widely throughout Japan, and is a regular contributor to the 'Nihon Dento Kogei Ten' (Japanese Traditional Arts Exhibition), the main annual event for traditional potters.